Primary production is of paramount importance in determining the distribution of carbon and oxygen in the sea and indirectly nearly all other biogeochemical processes. Since all other organisms are ultimately dependent on primary producers for food, the level of phytoplankton productivity establishes the basis from which energy flow through the ecosystem may be followed and provides an indication of the fishery potential of a given area. Although few data exist on productivity in Arctic waters, primarily on account of their inaccessibility and the inhospitable climate, it is generally considered to be unproductive. The Arctic is particularly interesting due to its light regime — in summer daylight is continuous, whereas in winter there are long periods with no light — and its complex zones of mixing that exist where waters derived from the Arctic Basin and from temperate regions meet. Most of the information on Arctic productivity has been gathered from inshore and subarctic waters with a limited amount from drifting ice stations and from submarines operating in and under ice near the North Pole. 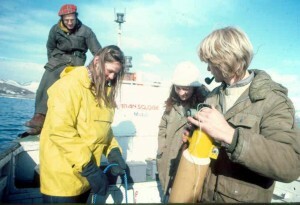 Sokolova and Solov’yeva (1971) making determinations off the Murmansk coast found the highest values of primary productivity to be about 30 mgC M-3 day -1. Measurements by English (1959) from Drift Station Alpha in the Arctic Basin also indicate low productivity. However, work by Digby (195 3 ) at Scoresby Sound, East Greenland, suggests a level of phytoplankton pigment similar to that found in the English Channel, although no productivity measurements were made. The Subarctic, by contrast, is a notably productive region as evidenced by the large crops of fish produced. The reasons for this high productivity are uncertain, but it is thought to result from a lifting of temperature inhibition by mixing of the Arctic water with warmer Boreal water, making possible the utilisation of nutrients in the Arctic water. Productivity may be determined either by measuring carbon-14 fixation or by measuring oxygen evolution using either an oxygen electrode or Winkler titration. Until recently, relatively low values of productivity could only be assessed on the basis of radio-labelled carbon assimilation (Steerman Nielsen, 1952). Difficulties in the interpretation of data suggest productivity values obtained in this manner may be unreliable. The opportunity of joining the Transglobe Expedition vessel, M.V. Benjamin Bowring, in Spitsbergen and travelling with the ship into the Arctic pack-ice enabled a study of primary production in these areas to be made using a recently developed oxygen technique of increased sensitivity attained through the use of a photometric end point detector (Bryan et al. 1976). Although this technique is not as sensitive as the carbon-14 technique, there are many advantages to this method: the easy interpretation of data obtained, the elimination of the use of radioactive materials, the lack of sophisticated equipment and the simplicity and rapidity of the technique allowing immediate analysis of samples. Productivity and ancillary measurements were made in three fjords in Spitsbergen in the open sea and in the pack-ice. In situ incubations were carried out in the fjords, but the needs of the expedition necessitated on deck incubations in the pack-ice and open sea. Although in situ incubations were preferable, it was thought that on deck incubations would give a relative indication of production levels and provide useful data on this process for Arctic waters. The results showed low values of primary productivity throughout the area with the exception of a single station close to the sea-face of a glacier in Kongsfjorden, Spitsbergen, where localised upwelling occurred.